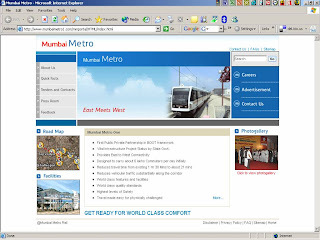 The Mumbai Metro One (MM1) website is up and running. For a project that's not yet begun, it's a reasonably informative website. However, once the project is up and running (stop rolling those eyes and please, a little less of the disbelief) I think they will have to significantly improve the website if they want to match the standards laid down by the Delhi Metro's website. 1. "About us" - From what's known in the press on the ownership of MM1 (i.e. specifically the Versova-Andheri-Ghatkopar, or VAG leg), Reliance Energy will hold 74% and MMRDA the balance 24%. No mention is made of this, at least not in the "About us" section. I don't know what to infer from this. DMRC has equal equity participation from GOI and GNCTD. GNCTD being Govt. of National Capital Territory Delhi and GOI being Government of India. In case you didn't know, the Delhi Metro is entirely Government owned and, I'm assuming, Government operated. 2. "Quick facts" - Most of this section is known in the public domain and a lot of this page is technical stuff. I found this disclaimer, in the tariffs part, interesting. + Rs. 6 upto 3 Kms. + Rs. 8 between 3 Kms.to 8 Kms. + Rs. 10 beyond 8 Kms. # Fares indicated are for 2003-2004 level and shall be revised @ 11% every fourth year (rounded off to the nearest rupee). Fares shall be fixed by Government of Maharashtra, through a notification. 3. "Press room": Disappointing. They've put up scanned .PDFs of a handful of articles. Delhi Metro has press clippings going back 5 years (Jan-02). Perhaps not a fair comparison, considering that MM1 has just been formed. 4. "FAQs" - Reasonably good and again most of it known in the public domain. Would be good if they'd said something about the costing of MM1, or on the contentious issue of the Skybus being cheaper than the Metro (as pointed out by Sid in his comment here), but I'd be asking for too much I guess. 5. "Roadmaps" - What could be the spiffiest part of the website looks inadequate simply because you have to download 4 powerpoint files to figure out the map, distance, etc.. In any case, these files are all a grab/copy/paste of a Google Earth view of Mumbai, but marked with the VAG route and the planned stations. Though I found this page informative, I also found it a bit tacky and not user-friendly. Hopefully, this will be done up when MM1 is operational. 6. Right to information - This is the tricky part. I'm guessing that since Delhi Metro is Government-owned, it comes under the purview of RTI (sample DRMC's RTI page on its website here). Will this apply to MM1, which is 74% owned by Reliance Energy, and hence a privately-owned entity ? It would be sad if MM1 does not fall under RTI, because the message I'd get would be that since MM1 is private it's not answerable to anyone, including the commuters on its trains. For example, will we get annual reports for MM1 the way that the DRMC has put up on its site ? Overall, I'm assuming that MM1 website is still in its initial phase and will be improved upon in the future.